Sometimes, a lightweight super thin slicer just won’t do. Enter, the hard use folding knife capable of heavy duty applications . There’s something reassuring about the heft of a big, chunky knife in your pocket that makes you feel like you can accomplish anything. So save the Swiss Army for another day and tighten your belt a notch because we’re looking at the best heavy-duty EDC knives. For the purposes of this list, we’ve picked several criteria that identify knives as heavy duty. Primarily, they’re big: all these blades are at least 3.5” of blade length, because you can’t do “heavy duty” stuff with a 2” blade. They all have relatively thick blade stock, so you’re not nervous about snapping the tip off when you’re digging into the hood of a Jeep in a junk yard. And they’re all equipped with extremely strong locks or other features which increase safety when the blade is open. So go ahead, and slip into something… heavier-duty. The Benchmade 275 Adamas is the prototypical heavy-duty Benchmade folder – or at least since the Large Rukus left production, and took its 4.25” flat ground blade with it. Not to worry: the Shane Sibert-designed Adamas is all the overbuilt Benchmade goodness you’ll ever need. It’s a big knife, without a doubt: stretching out 8.70” overall, the Adamas weighs in at a hefty 7.70 ounces. The blade is 3.82” long, and has a shallow flat grind with a spine that stretches almost halfway down the blade before the primary bevel begins. There’s also a fuller groove for strength. Made out of D2, an old-school high speed tool steel that’s long on strength and edge retention but short on corrosion resistance, the black coating serves as a barrier against rust. With a Rockwell rating between 60 and 62, the Adamas will stay sharp for quite a long time. Like most Benchmade’s, the Adamas features the Axis lock – a slick piece of engineering that uses two omega-shaped springs to force a lock bar on top of the tang of the blade, which is anchored to the scales and liners. It’s very smooth engaging and disengaging, and in the Adamas it’s overbuilt compared to “normal” Benchmade’s – they claim the lock can withstand up to 800 pounds of lock pressure before failing, which is borderline ridiculous. You can get an Adamas in either black or tan G10 handles, with a plain edge or a partially serrated blade. There’s also an automatic version available for an extra $40 if you’re legally allowed to purchase and carry one where you live. There are plenty of choices for a heavy-duty knife from Spyderco: the stunning integral handle Rassenti Nirvana, the enormous Tatanka with its modified lockback, the beefy Peter Carey Rubicon – but the Manix 2 XL is a heavy-duty knife done Spyderco style. It’s a big knife: with a 3.875” blade and an overall length of just shy of 9” open, the weight of 5.20 ounces is actually pretty light. Especially considering that it’s full stainless liners under G10. The party piece of the Manix 2 is the ball-bearing lock, a design so strong that the weak point is almost inevitably the handle itself rather than the lock components. A stainless steel ball is pushed by a coil spring on top of the blade tang, functioning in a similar manner to the Axis lock but with a narrower overall profile and a smooth disengagement once broken in. The ergonomics are classic Spyderco: deep finger choils allow a solid rearward or forward choked up grip. The blade is a tall leaf-shaped blade, full flat ground from CPM S30V with a 3.36” effective cutting edge. Like other high-end domestic produced Spyderco’s, nice details abound: there are flush-fitting body screws that line up with the scales when tightened down, a press-fitted lanyard tube that acts as a structural member at the back of the handle, and a stainless spoon-style clip that’s configured for ambidextrous tip up carry. The oversized thumb hole allows you to open the blade from the front or the back, or you can you pull back on the lock release and whip the blade out. While the regular Manix 2 in lightweight format is a great candidate for the ideal “every day carry” knife, the Manix 2 XL makes a convincing argument that there’s nothing wrong with carrying an almost 4” blade on a day to day basis. Picking just one Zero Tolerance (ZT) knife to represent the brand as a heavy-duty EDC is difficult; hard-use knives are ZT’s bread and butter. They’re what the brand started out making before it became the Lexus to Kershaw’s Toyota, and made in the USA to boot. A lot of their products now focus more on premium materials and big name designers than super thick blades and overbuilt construction – which isn’t a bad thing, the Sinkevich ZT’s are amazing – but thankfully if you still want a pocket tank of a ZT there’s some choices. It’s hard to select just one, but for us it’s the Les George designed 0909. Why? Well, it has a lot of the hallmarks of old ZT’s and some of the nicer features of new ones that creates a wonderful mix of high tech and heavy duty. The blade is no lightweight: at just under .16” thick, the drop point blade is made of CPM S35VN, the perfect all-around stainless steel for everyday use. A stonewash finish resists corrosion and gives the 0909 a beautiful appearance. A high hollow grind with a narrow swedge puts some strength behind the tip while still helping the 0909 slice as well as can be expected. Like most new ZT’s, the 0909 utilizes a flipper and rides on a KVT caged ball bearing pivot, making deployment quick and effortless. But shades of older ZT’s abound: a 3/8” hex head bolt adjusts pivot tension like the classic 0200 and 0300 models, so there’s no need to worry about stripping out a delicate torx screw. Contoured G10 scales sit atop full stainless liners with a very thick liner lock – bigger than some frame locks. A deep carry pocket clip is configured for ambidextrous tip up carry, and flow through construction makes cleaning the 0909 out as easy as blowing compressed air through it. If you want a big chunk of something old and new, the 0909 is ready for anything you can throw at it. What more do we need to say? If you want a heavy duty knife, Cold Steel is a first stop. And if you want a heavy-duty designer, Andrew Demko has your number. The creator of the incredibly strong Tri-Ad lock is a smart and soft spoken individual whose knives run the gamut from mild to wild. The 4-Max is the most advanced production knife Cold Steel has ever made. Originally US made but then Cold Steel has shifted production to an Italian manufacturer using the same materials, likely LionSteel who is known for their fit and finish and tight machining. The 4-Max is based on Demko’s AD10 model, a popular knife with the custom folder crowd. Unusually for such an adaptation, the 4-Max is significantly bigger than the AD10 – with a 4” blade versus a 3.75”, and an overall length of 10” versus the AD10’s 8.75”. Make no mistake, the 4-Max stretches the definition of “everyday carry” to the very limits, with a pant-sagging 9.20 oz weight. To put that in perspective, that’s more than a Manix 2 Lightweight, Al Mar Eagle Ultralight, and a Spyderco Paramilitary 2 – combined. What do you get for that paperweight figure? Well, there are full titanium liners covered by contoured desert tan G10. A super thick (0.18”) 4” long stonewashed drop point blade made from CPM-20CV steel – similar to CTS-204p and Bohler M390 at the very top of today’s class of super steels, offering extreme wear resistance, toughness, and corrosion resistance. Of course there’s the Demko-designed Tri-Ad lock, which is overbuilt to an absurd degree here making what Cold Steel claims is one of the strongest folding knives in the world. There’s also a geared titanium backspacer, and the overall fit and finish of the knife is several steps above Cold Steel’s normal products. If you don’t mind the extreme mass or the high price tag, you can get one of the toughest knives ever made with the best materials on the market for less than half the cost of a true custom. Almost every time we publish a top ten list, at least one LionSteel winds up on it. Whether it’s lightweight EDC’s, Gentleman’s folders, or heavy-duty, chances are you’ll see one of their products – and maybe more, considering LionSteel has become the go-to OEM for small brands (like the DPx Gear and Pohl Force) as well as for bigger brands that want to make a small run of high-end knives (like the CRKT Hi-Jinx, Spyderco LionSpy, and the Bastinelli BBR2). LionSteel’s own products are always amazing to handle and to use – and the TM1 breaks a lot of new ground for the Italian brand. What’s so special? How about an integral frame (single piece) with a lockback? Oh, and a ball-bearing pivot. How exactly do they assemble these knives? Can’t say we know, but that’s LionSteel’s trick: turning magic into knives. An integral frame means there’s no weak spot for the hardware to shear apart, and also gives a uniquely smooth grip in hand. The TM1 comes in two versions: a Micarta handle version in the $200 range, or a carbon fiber version in the mid-$300 range. The weight difference between the two is negligible (about a tenth of an ounce) but a single 3D-contoured slab of carbon fiber certainly is pretty. As with a lot of LionSteel knives, the blade is incredibly thick – a 0.18” chunk of Sleipner steel, which is an upgrade of D2 but with superior corrosion resistance and edge retention. The 3.5” blade has a high flat grind and a clip point shape with a high tip – above the centerline of the blade, a characteristic of Molletta’s designs that makes them good for hunting and batoning, but sometimes cumbersome in everyday use. But then again, the TM1 isn’t really intended for slicing open mail and packages from Amazon. If you want a heavy-duty knife from (or made by) LionSteel you’re spoiled for choices – it’s hard to make this list and not include the ultra-beefy SR1 or Spyderco LionSpy – but the TM1 goes above and beyond the industry norm to deliver a folder that’s both heavy-duty and beautiful – a sure winner. If the Sebenza is the king of high end production daily carry knives (debatable, yes), then the Umnumzaan is Chris Reeve’s interpretation of the ideal hard-use daily carry knife. That’s not to say the Umnumzaan (which never gets easier to pronounce) is rough around the edges, just that it’s got more meat in the places where a Sebenza is lithe and light. While it might look like “just another titanium frame lock folder”, the devil’s in the details – lots of small things add up to make the Umnumzaan stronger than most folders. The oversized pivot barrel carries two hollowed out thrust washers that extend almost to the edge of the scales, which carry fluorinated grease in pockets to keep the action smooth and the lubricant itself free from contaminants longer than a typical solid phosphor-bronze washer. The thumb stud openers also double as the stop pins for the blade, and each has a rubber gasket set into a channel which cushions the impact of the blade as it opens – an innovation by the inimitable Grant & Gavin Hawk. Another interesting tech tidbit is the interface between the lock bar and the blade tang isn’t actually the lock bar itself, but a ceramic ball that also works as the closed detent, so there’s no titanium-on-steel lock stick. A clever and intricate piece of machining that could only spring out of the fertile mind of South Africa and/or Idaho’s most prolific knifemaker. The rest of the knife is somewhat conventional but decidedly high end. Blade steel is Crucible CPM S35VN, which Chris Reeve participated in the development of as a replacement for CPM S30V. The 3.675” blade is available as a drop point or a tanto shape, both with a smooth stonewashed finish. The 6AL4V titanium handles use hourglass stainless standoffs for flow through construction, and a bent steel pocket clip fits into a machined channel on the lock bar side, for right hand tip up carry. The cost is high, but the standard of construction at Chris Reeve is commensurate with the lofty price tag. CRK has spent decades building up a reputation as a company that produces nothing but perfectly made knives, and they don’t turn out 14 new products per quarter, preferring to focus on evolutionary quality improvements to their products. The Umnumzaan applies those strict principles to a heavy-duty folder, so what’s not to love? Reate is proof that the cutlery industry in China isn’t all Taylor Brands junk or Frost Cutlery throwaway knives. David Deng is a knife enthusiast first, and a machining perfection enthusiast right behind that – and every knife that comes out of his facility pushes the boundaries of perfection for how good a “production” knife can actually be. Reate is so good at making knives that other people use them as an OEM for midtechs – most notably Todd Begg, who subcontracts the Steelcraft series (the Sun Tzu Kwaiken, Mini Bodega, and Field Marshall) out to Reate. The Horizon is a long-running series of knives from Reate, the first two of which – the Horizon A and Horizon B – have already been discontinued. For now, the Horizon lineup consists of the Horizon C, the Horizon D-Ti, and the Horizon CF. All of them have the same basic shape – an organic flowing handle with a deep rear choil, and a 3.75” drop point blade with fuller that runs towards the top of the blade. They’re all titanium framelocks, with a thick lockbar and a replaceable lockbar insert. And like all Reates, they’re exceptional flippers – with unique multi-row caged ball bearings, with 18 ceramic ball bearings in two concentric circles per side to distribute the load more evenly for a smoother action. The differences are in materials. The Horizon C, the lower end model, has flat titanium scales available in natural grey or an anodized black or light blue finish. A 3D-machined titanium pocket clip, oversized pivot hardware, and titanium standoffs aren’t normally features of a $250 retail knife. On the black coated version the clip and standoffs are gold, while the blue version has matching blue hardware. The blade is stonewashed Crucible CPM S35VN stainless steel, hardly low-end stuff, but things get even more impressive when stepping up to the Horizon D.
The Horizon D-Ti has intricately 3D-Machined titanium handles in a fluted pattern, and a bright blue geared backspacer adds visual interest. A topographical pattern is etched into the blue pivot and 3D pocket clip, and blue hardware brightens up the whole package. The blade is still a 3.75” stonewashed drop point but steel is upgraded to Bohler M390 for the Horizon D, with a 62 Rockwell – this steel is widely recognized as one of the absolute best stainless cutlery steels currently available. The Horizon D-CF features all the same upgrades but the display side is a solid piece of 3D machined carbon fiber with the same fluted pattern, for about a 1 ounce weight reduction over the solid Horizon C models. Both of the Horizon D’s retail for $399 – it’s up to you if the aesthetic details and the steel upgrade are worth the $150 price bump, but the Horizon C is hardly “slumming it.” A knife that functions equally as a piece of art, an addictively fun flipper, and a hard-use blade is a rare combination. Hogue in general makes heavy-duty knives. The Allen Elishewitz designed line of fixed and folding knives has been making waves with enthusiasts, with their top-notch fit and finish, solid materials, and smooth button-lock action. We reviewed the EX-04 recently and found its mix of unique ergonomics and design and high quality materials to be quite memorable. The latest design from Hogue’s knife division is sure to not be forgotten – the X-5 Flipper is a striking knife. The primary draw is that it combines a button lock with a flipper – there are only two other button lock flipper knives on the market, both from more obscure brands than Hogue – the Freeman Knives 451 BLF and the Spartan Knives Pallas. The X-5’s party trick is its patent-pending blade retention system, which is unique when it comes to knives. There is a thin metal spring plate mounted inside the handle on the lock side with a detent ball. A channel is cut radially around the pivot of the blade that ramps up into the detent hole, so when the blade is closed the spring provides tension for a faster opening – traditionally a weak point of button lock knives, which is usually overcome by a full-on coil spring in automatic knives. By integrating a detent ball into a button lock, they’ve made a knife that closes as smoothly as a normal button lock, but opens very quickly. Clever technology. The blade comes in two sizes – 3.5” or 4” – and two shapes, a spear point with a harpoon style swedge, or Hogue’s wild looking modified Wharncliffe which has a compound grind and a reverse tanto forward edge. For looks, the Wharncliffe draws more eyes – for real use, the spear point will be a far more practical day to day choice. There are a variety of finishes available – black coated or flat dark earth colored blades, as well as a variety of different color aluminum handles with “G-Mascus” inlays. If you want something a little different in the heavy duty category, this Hogue flipper is worth a try – assuming you like the looks. Viper Knives has come up a lot in public perception in the past few years, and that’s thanks in no small part to their collaborations with Jesper Voxnaes. The Danish designer’s style is recognizable regardless of who’s making the knives – with collaborations from Viper, Fox, Spyderco, CRKT, Boker, ZT and others currently on the market. His trademark style is identified by the soft oval thumb hole opener, unique 3-dimensional backspacers, gentle curved handles with palm swells, and broad blades with plenty of belly. All of these are also attributes that make for a great hard-use knife, so picking out just one Vox design for this list was hard, but the Viper-built Fortis flipper is a natural fit. All Fortis models share a stonewashed 3.50” drop point blade made from Bohler M390, which is surprising given the $165 starting price point. In fact, a lot of stuff is surprising given the price point of the Fortis: a titanium framelock, 3D-machined titanium pocket clip, a thrust bearing pivot, replaceable lockbar insert, intricately machined backspacer, and contoured G10 handles are all hallmarks of a more expensive knife. The premium versions of the Fortis don’t add much to the bottom line – a full titanium version is another $25 and adds an anodized blue clip and backspacer, and a carbon fiber version comes in just under the 4-ounce mark for another $20. You can choose between a flipper and a thumb hole to open the blade. Speaking of choices, the G10 models come in an olive drab green, black, or safety orange with a stonewashed blade – while the full titanium and carbon fiber versions are available with either a stonewashed or a satin finished blade, depending on your preference. No matter which version, the Fortis offers an intriguing option for a full-sized Vox design that’s a remarkable value for money in addition to being a stout hard use every day carry option. Despite the recent announcement of their closure, I felt Strider was deserving of a mention here. 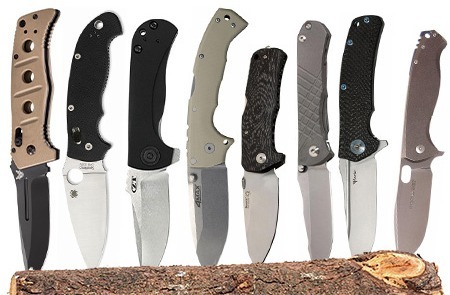 Along with Rick Hinderer and Greg Medford, Mick Strider is perhaps the best known name when it comes to hard-use folders. While his brand and personal history isn’t without… controversy, there’s no denying that Strider makes a solid product that’s backed up by years of experience and legions of rabid fans. Their mainstream product was the SnG, which is named after two servicemen, Shughart and Gordon, who lost their lives in Somalia in 1993. It fits neatly between the 2.87” PT and the 3.9” SMF with a just-right 3.5” blade. Nothing about the SnG is subtle. The triangle handle is a hallmark of Strider design, and while it looks unconventional it’s quite comfortable in hand. The lock side is made from an extremely thick slab of titanium, with a Hinderer-style lockbar overtravel stop, while the show side is a single piece of G10 that also includes the backspacer, rather than having it made out of a separate piece, for strength. There’s an oversized pivot which unfortunately uses a proprietary fastener (although there are guides to be found on YouTube as to how to make your own pivot tool), and a bent titanium pocket clip attaches with a single screw but is anchored in a slot on the lock side to prevent slippage. The standard SnG is a 3.5” spear point blade that measures a beefy 0.16” across, but there’s also a Tanto blade model available if that’s your thing. Blades come in either a standard stonewashed finish, or a unique flame-treated tiger stripe pattern. Blade steel is Carpenter CTS-40CP, an uncommon steel that is basically the powdered metallurgy version of 440C, with slightly better edge retention and finer grain structure for a sharper edge. You can still get them though it’s a tough sell at the $420 price tag, but the price of exclusivity is rarely rooted in reason. Strider’s products have been through some of the toughest conditions all over the world, so there’s no doubt the SnG would fill the hard-use void in your pocket with aplomb. That’s it for our list of hard-use folding knives. What do you think? Did we leave your favorite out? Get in touch and let us know.